Minnesota possesses a multi-layered history of geologic time, through the spiritual connection of Native Americans, to early settlers' trade routes on the Mississippi River and Lake Superior. Respect for the land is evident in the pristine waterways and forests, and in the ethical patterns of farming. 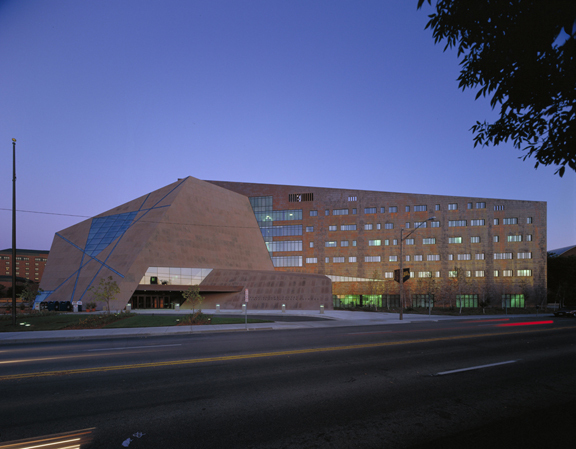 The University of Minnesota stands as an expression of its home state and the Gateway Center seeks to introduce the campus and its visitors to these essences of Minnesota, while reinforcing the urban crossroads nature of the Gateway site. 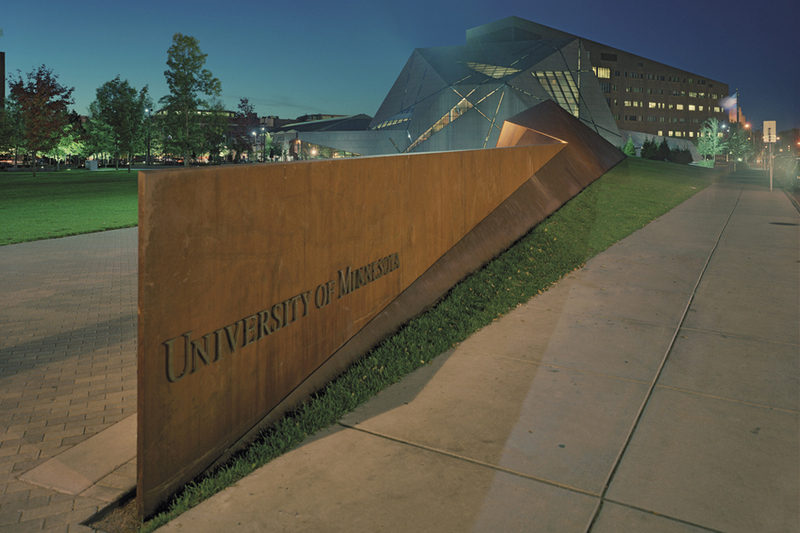 Situated at the intersection of University Avenue and Oak Street, the site for the new University of Minnesota Gateway Center­a ceremonial gathering place­occupies a major entrance to the campus. The design for the center invites visitors to the campus through the embodiment of Minnesota images­ambiguously evoking a rock face or the iconic huddle of the Minnesota farmstead. The structure consists of three distinct forms: the large glass, granite and wood memorial hall which is adjacent to a sloping copper structure nestled against the regulating office block at the north. Seen both as the casual and formal heart of the building, Memorial Hall is an irregular polyhedron of colliding granite planes and glazed fissures which allow sunlight into this large open gathering space. 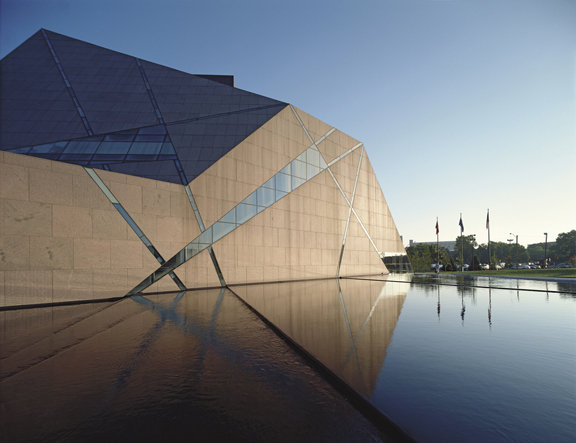 Abstracting the granite strata of Minnesota, with the admixture of water, the Memorial Hall rises out of the ground as an "upheaval," binding the building to the place. Once inside the space of the hall, one is confronted by the interweaving programmatic spaces with balcony and stair projections. 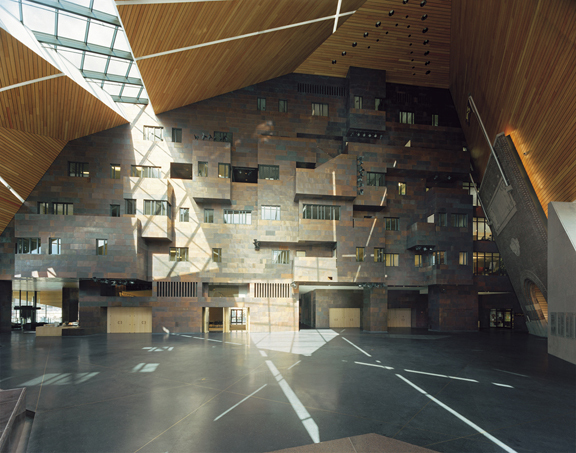 Sheathed in the same copper as the exterior, each floor level is expressed on the internal wall in solid and void relationships, while the facets of the main hall are clad in gapped hemlock planks. The salvaged fifty-five foot high "Memorial Arch" from the razed stadium formerly occupying the site was mandated as a part of the building. 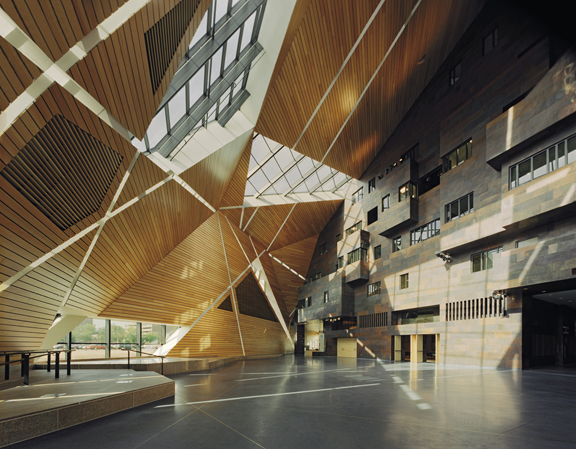 It is 'hung' on one of the interior tilted polyhedral facets like a painting. "Memorial Arch" becomes a literal gateway to the past, serving as entry to the Heritage Gallery of the program. Urbanistically Memorial Hall occupies a nodal position guiding pedestrian flow from a future plaza of tilted granite planes, trees and water on to the campus beyond. The planar displacements of the plaza will become foreground to the planar conditions of the fractured granite monolith which contains Memorial Hall. 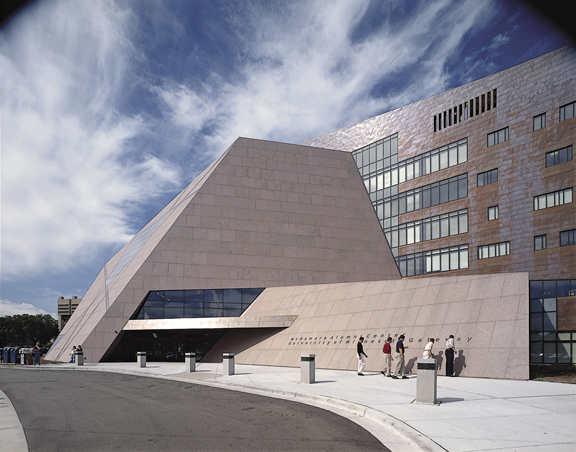 Occupied by the University of Minnesota Foundation, the Minnesota Medical Foundation, the Alumni Association the Board of Regents, the building allows these four departments to remain separate at the core of the building yet connect at points of public and student participation. 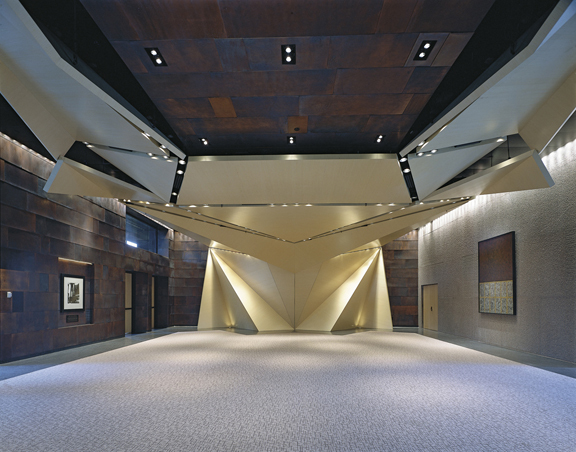 Each of these important foci holds a strong visual presence and relationship back to Memorial Hall. Thus, Memorial Hall becomes a lively cultural crossroads, whether it be for events like a Regents meeting, a professorial chair investiture, a public lecture, a brown bag lunch, casual encounters or tailgating for the nearby hockey arena. In association with executive architect KKE Architects, Inc.